Paroxysmal nocturnal hemoglobinuria (PNH) is a rare life-threatening and debilitating clonal blood disorder and is caused by an acquired mutation of the phosphatidylinositol glycan (PIG)-A gene of the pluripotent hematopoietic stem cell, leading to a deficiency of glycosylphosphatidylinositol (GPI)-anchors and GPI-anchored proteins on the surface of affected blood cells, including the complement regulators CD55 and CD59. PNH red blood cells are highly vulnerable to activated complement with the formation of the membrane attack complex (MAC). This results in chronic intravascular hemolysis as the underlying cause of morbidities and mortality in PNH. Until recently, the treatment of PNH has been largely empirical and symptomatic with blood transfusions, anticoagulation, and supplementation of folic acid or iron. Potentially, the only curative treatment is allogeneic stem cell transplantation, in case of severe complication with a high rate of mortality and morbidity. A new targeted and disease-modifying treatment strategy is the inhibition of the terminal complement cascade with a humanized monoclonal anti-C5 antibody (eculizumab). Therefore, the MAC formation along with the intravascular hemolysis is effectively inhibited. 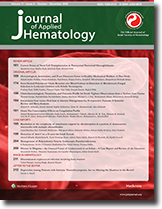 Eculizumab has shown significant efficacy in controlled studies leading to a marked decrease of anemia, fatigue, transfusion requirements, renal impairment, pulmonary hypertension, and the risk of severe thromboembolic events, thereby leading to an improvement in the quality of life and survival. The transfusion of blood and its derivatives is a vital supporting service to clinical medicine. However, over the years, 2 considerations have been of major concern to both health planners as well as professionals in charge of blood banks, namely, self-sufficiency and safety. In the Kingdom of Saudi Arabia, the blood transfusion service is predominantly a hospital-based blood banking system. Despite the shortcomings of this system, self-sufficiency has been attained with respect to fresh cellular components (packed red blood cells and platelet concentrates) and plasma derivatives (fresh frozen plasma and cryoprecipitate). However, since the requirement for hemotherapy is phasic in nature and variable in quantity, hospital blood banks are exposed to frequent shortages in the supply of single components when heavy demands of that component arise. As to the second issue of safety, specifically reducing the risk of infection with transfusion-transmitted pathogens, it is addressed satisfactorily by undertaking newly emerging screening assays, including nucleic acid testing[A4] for hepatitis B and C and human immunodeficiency viruses. The continuous expansion in the number and sophistication of assay techniques designed to detect an everincreasing number of pathogens leaves a lot to be desired. Malaria, for which there is no specific and sensitive screening test, remains a daunting challenge. Additionally, viral inactivation of the frequently consumed fresh frozen plasma as well as universal leucodepletion is yet to be implemented in all blood banks. Current efforts led by the Ministry of Health towards establishing a unified national blood transfusion service, based on non-remunerated voluntary donors, is a dream that should not take long to come true and will no doubt be the ultimate answer for self-sufficiency and safety. Inherited thrombophilic factors are risk factors for venous thrombosis. This study aimed to estimate the frequencies of factor V Leiden (FVL) and prothrombin G20210A mutations and protein C, protein S, and antithrombin III deficiencies in individuals from south Iran and the impact of these factors on the incidence of venous thrombosis in this area. The study population included 135 patients with venous thrombosis and 1200 healthy blood donors. The protein C, protein S, and antithrombin III activities were measured, and the prothrombin 20210A and FVL mutations were analyzed using polymerase chain reaction-based highresolution melting analysis and restriction fragment length polymorphism with genomic DNA. The frequencies of protein C, protein S, and antithrombin deficiencies in the control group were 0.33% (95% confidence interval [CI]=0.30Π 0.36), 0.25% (95% CI=0.23Π0. 27), and 0.08% (95% CI=0.06Π0. 10), respectively, and for the patient group were 5.3% (95% CI=1.5Π9. 1), 3.8% (95% CI=0.5Π7. 0), and 4.5% (95% CI=0.9Π8. 0), respectively. The allele frequencies of FV Leiden and prothrombin 20210A in the control group were (0.0175 [CI=0.0122Π0. 0227] and 0.0200 [CI=0.0144Π0. 0256], their frequencies in the patients were significantly high 0.196 and 0.181, respectively. Thus, in the area studied, the genetic background clearly affected the onset age and the clinical course of thrombosis. Approximately 41.5% of the patients who were from the study area and had DVT had at least 1 of these predisposing genetic factors. Objectives: β-Thalassemia major (β-TM), a prevalent medical condition, is associated with multiple endocrinopathies. We aimed to evaluate the prevalence of endocrinopathies between 2006-2010 in children and adolescents with β-TM and were 2-18 years old. Patients and MethOds: This retrospective study involved children and adolescents with β-TM (n=143, 62 females, 57.81% were pubertal, and 81 males, 56.96% were pubertal) presenting at the pediatric endocrine clinic at King Abdul-Aziz University Hospital. The mean and standard deviation (SD) for age were 10.96 and 4.4. A comprehensive review of patient serum analysis, and medical records were done. Results: Vitamin D (Vit. D) deficiency was the commonest (56%) endocrinopathy in both children and adolescents with β-TM, followed by pubertal delay (29.37%) and hypothyroidism (21%); 7.6% of the patients had no endocrinopathies, and 45.5% had 3 or more endocrinopathies. Growth hormone deficiency was observed in 12.58% of the patients. The overall mean and SD serum ferritin levels were 3400.86 and 3067.43 ng/mL, respectively. Iron overload worsened as the children grew older; the mean and SD serum ferritin levels were 2893 and 1919 ng/mL, respectively, for pre-adolescents and 4299 and 4276 ng/mL, respectively, for adolescents (P=0.0368 [S]). cOnclusiOn: Children and adolescents with β-TM are at risk of multiple endocrinopathies. Vit. D deficiency, delayed puberty, short stature, and hypothyroidism are the prevalent complications of iron overload. We recommend the promotion of early screening programs for iron overload to prevent endocrinopathies among children and adolescents with β-TM and prophylactic Vit. D supplements. Background: Lupus anticoagulant (LA) refers to a group of autoantibodies that inhibit certain phospholipid-dependent coagulation reactions, and typically cause prolongation of activated partial thromboplastin time (APTT). These are diverse laboratory tests for antiphospholipid antibodies (APAs). This situation is compounded further by the lack of ΢ a golden standardΣ for their detection and this has resulted in wide variation in LA testing between laboratories. The aim of this study is to evaluate the sensitivity of a wide range of assay procedures and reagents in common use for the detection of LA in patients with recurrent fetal loss. Patients: Citrated blood samples were collected from 110 women with recurrent fetal loss (RFL) attending a special outpatient RFL Clinic, King Khalid University Hospital, Riyadh. They had history of 3 or more consecutive spontaneous unexplained abortions before the 10th week of gestation. Their ages ranged from 20 to 43 years (mean=30΁7.5). Control group: 110 normal healthy Blood Donors. Blood Sample Processing: Citrated blood samples were subjected to double 15 min centrifugation at 3000 rpm. The resulting platelet poor plasma (PPP) was either tested immediately or stored in aliquots in the frozen state at -40ͱC for testing later. Results of laboratory Tests Used For Detection La: the detection rates for LA among RFL patients versus healthy controls are as follows: * The activated partial thromboplastin time (APTT, Manchester Reagent) (17.3% vs. 3.6%) • Mixing studies either with normal plasma (NP) or the platelet neutralization procedure (PNP): * Prolonged APTT + NP: (11% vs. 2.7%); * Prolonged APTT + PNP: (6.3% vs. 1.8%) * The Staclot-LA test kit (Diagnostica Stago, France) (25.5% vs. 6.3%); * PTT-LA (Diagnostica Stago, France): (4.5% vs 4.5%); * The Kaolin Clotting Time (KCT) (28.1% vs. 1.8%); * The Dilute RussellΥs Viper Venom Test (dRVVT), (35.5% vs. 6.3%). Conclusions: The dRVVT followed by the KCT identified more patients with LAC among those with RFL, than the other tests, particularly the lowphosopholipid APTT (Manchester Reagent). Staclot LA is a complete system of confirmatory and screening tests. Staclot LA is easy to perform and commercially available as a complete test system, containing both testing and confirming for LA. PTT-LA is least sensitive for the detection of LAC. The other more feasible confirmatory test is PNP combined with a sensitive APTT reagent. Depending on the available financial resources, laboratories may follow different practices in diagnosing LAC ranging from one test to combinations test procedures. Background/aim: Bone complications in sickle cell disease (SCD) have been well documented, but the mechanisms underlying SCD are poorly characterized. Therefore, we conducted this study to elucidate the factors affecting bone health in patients with SCD by measuring bone turnover markers and correlating them with bone mineral density (BMD). Patients and methods: Serum from 30 patients with confirmed SCD and 20 age-matched healthy controls were included in the study. Dual X-ray absorptiometry was used to determine the BMD of the lumbar spine (L2ΠL 4) and of the whole body. results: According to the WHO definitions for T-scores, 30% of HbSS patients were osteopenic (30%) or osteoporotic (50%) in at least 1 of the 3 studied locations. BMD, serum calcium, and parathyroid hormone (PTH) showed a significant decrease, while PO4, osteocalcin (OC), and bone-specific alkaline phosphatase (b-ALP) showed a significant increase in the patient group compared to the control group (P<0.05, for all). Multivariate analysis identified only serum PTH as an independent determinant of low whole-body BMD in HbSS (P=0.0399), whereas it identified osteocalcin, magnesium, and CTX as independent predictors for PTH. conclusions: These findings suggest that low BMD is prevalent in SCD and that blunted PTH response to reduced total calcium levels and accelerated bone turnover may be the underlying mechanisms. Heparin-induced thrombocytopenia (HIT) is an adverse drug reaction caused by antibodies to heparin/platelet factor 4 (PF4) complexes and results in the prothrombotic state. Early diagnosis is important for clinical decision making. Various laboratory tests have been examined as a tool for confirming the suspicion of HIT. The monospecific PF4 immunoglobulin G (IgG) assay is a qualitative screening assay for detecting heparin-associated IgG antibodies in human serum. Of 100 patients with clinical suspicion of HIT, the blood samples of 20 patients who had positive clinical pretest probability scores were tested at our institute for particle gel immunoassay (PaGIA; Diamed ID; Switzerland), enzyme-linked immunosorbent assay (ELISA) (HPF4 ELISA; Stago, Asni•r es sur Seine, France), and the new monospecific ELISA (IgG) from GTI, USA. The optical density (OD) of the color that developed was measured using a spectrophotometer. These samples were collected from the patients at the same time as were samples that were sent to a reference laboratory for a gold standard test (serotoninrelease test). Of the 20 samples tested, 1 was clearly positive and another 1 had borderline positivity in the serotonin-release test. The results of all 4 tests were in agreement for all samples, except for the sample with borderline positivity, which was missed by ELISA (STAGO). The frequency of samples positive for HIT antibodies was 10%. Although this study included a low number of cases with clinical suspicion of HIT, our results confirm the good sensitivity and specificity of the monospecific ELISA that could be more sensitive than polyspecific ELISA. Postpartum hemolytic uremic syndrome (HUS) is a well-documented rare complication after pregnancy with various triggering factors. We present the case of a 22-year-old Saudi female admitted in labor at 39 weeks of gestation with mild preeclampsia and a probable intrauterine fetal death. The patient underwent spontaneous vaginal delivery and was found to have abruptio placenta. Within 48 hours, she developed microangiopathic hemolytic anemia, thrombocytopenia, and acute renal failure. Plasma exchange using fresh frozen plasma was initiated immediately, and she recovered completely after 11 sessions[Author4]. This manuscript describes the details of this case in addition to a literature review of the reported cases of postpartum HUS.